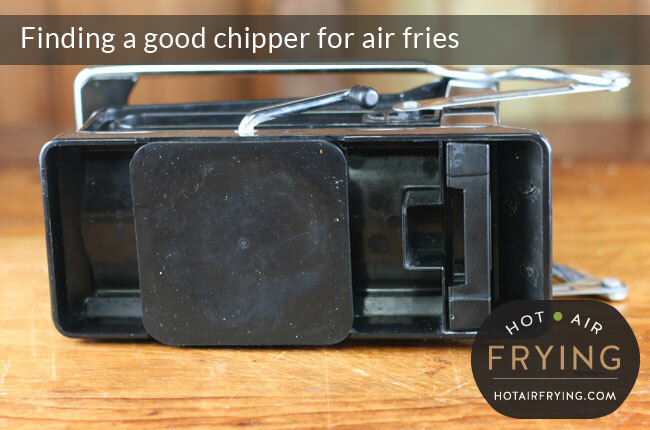 When you get a hot air fryer, I would say you then need to make sure you have two other pieces of equipment: a good chipper, and a good vegetable brush. 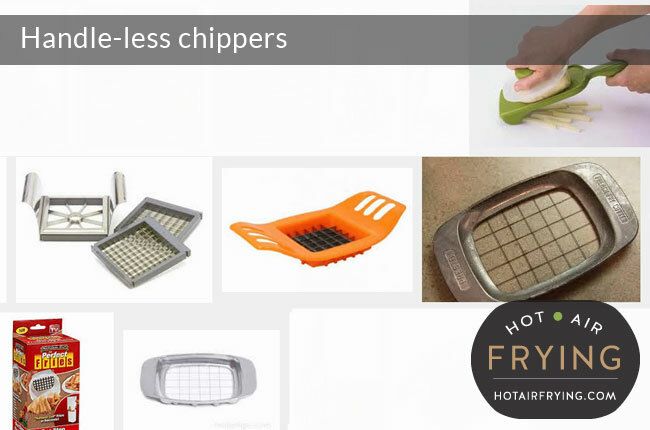 I think Americans sometimes call a chipper a “French Fry Cutter”. In any event, it’s a machine used to quickly, easily and safely turn potatoes into what is called “chips” or “fries” or “frites”, depending on what part of the world you are in. As to whether to just use a bag of frozen fries, see my separate piece on frozen fries versus from-scratch fries in a hot air fryer. 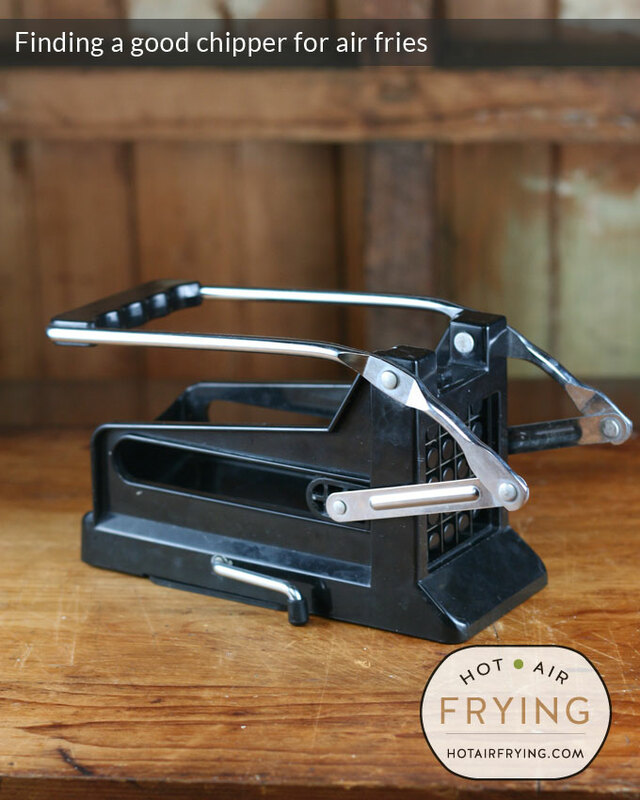 I remember growing up in the 1960s in small-town Ontario; deep-fat frying (and potato eating) was common enough then that some kitchens had metal chippers that were mounted on the wall; when you pressed the potato through by leaning down on the handle, the chips would fall into a pot or a pail you’d placed below it. It looked easy peasy from what I can remember to process a mess of potatoes in a hurry. 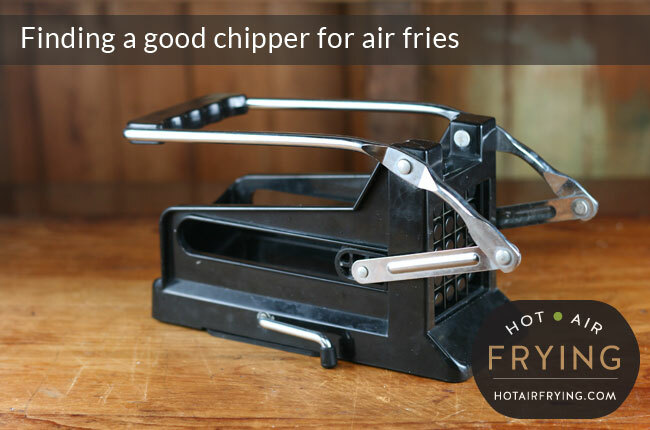 The days of that quantity of fries needed at one time in a household feel long gone for some reason; yet, because of the advent of hot air frying, here I am talking about chippers, and I never would have predicted that. Most chippers are still manual; I would say that most households really don’t need an electric one, as the manuals can be so efficient and fast. Modern chippers all come apart these days for whipping them into the dishwasher, though usually a quick rinse under the tap is all they need. And they are very compact these days; it’s easy to find one that wants only a small amount of storage space on a shelf or in a cupboard. Here is a picture of it. I think the make name was Zyliss. It is all plastic except for a sharp metal grate. It comes apart for easy cleaning. As we got to use it more and more, though, we found that a couple of the white plastic teeth chipped off. Entirely our own fault — pressing too hard on some potatoes probably, but still sometimes that just happens because a potato gets a bit stuck going through. One day, we noticed this black Starfrit potato chipper at Walmart for 20 bucks, so we got it to try it, and ending up loving it. It has a suction pad on the bottom. 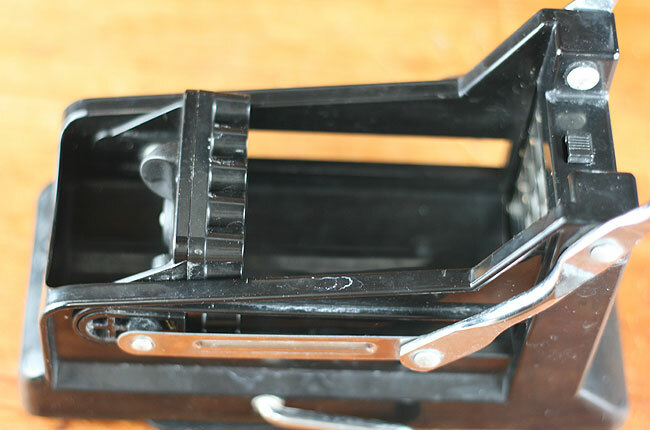 There’s a clamp on the side that you turn to cause that rubber suction pad foot to kick into action on your counter. Lots of times, though, I find I really don’t need to lock it into place — the rubber place on its own provides enough natural grip it seems. Or maybe I’m just too lazy to take that extra step! It can hold quite large potatoes inside. Still, though, if the potato is snug in there, I halve or quarter the potato so that it doesn’t jam up. We’ve had it for a year now, used it 5 or 6 times a week, and it’s holding up very well so far. It’s even fast enough for when we’re making chips / fries for 6 or 8 people at a time. It comes apart easily in three pieces for easy cleanup: either a trip through the dishwasher or a quick rinse under the tap. Usually I just give it the quick rinse, with maybe a dishwasher trip once a month for good measure. The plastic is far sturdier than I would have credited it for, if you’d asked me in advance. So far I’d have to say that I’d definitely buy this model again. Screen cap from Google images. August 2014. I’ve seen pictures of chippers with no handles on them. Above is a screen cap from Google images for discussion purposes. They are framed grates that you press down on. They would be great to store, for sure, because they’d fit into any drawer. But, they strike me as though they would need a lot of pressure from you leaning down, and I can just about imagine the potato going flying on me. I think with other chipping machines, such as I showed pictures of above, that have good long handles, is that the handles provide leverage, transforming the small effort you put into pressing down into a large amount of pressure that reaches the potato. Now of course if you only make chips / fries two or three times a year, then of course it’s not worth the kitchen storage space for a dedicated potato chipper. I’m sure you can use a chipper for sweet potatoes, but I’m not sure much what else you could use it for. Maybe to make batons of beet, celeriac, turnip, etc. You could also get by with just cutting up the fries manually with a knife. Some people with younger teens have said that they feel safer if their kids use an actual chipper chipper, as opposed to a knife or a mandoline, as it’s a fair bit harder to hurt yourself with a chipper. For me, being able to make homemade crinkle cut fries would be a Holy Grail, and it is what I miss most about bags of frozen fries. Google image search screen capture. August 2014. 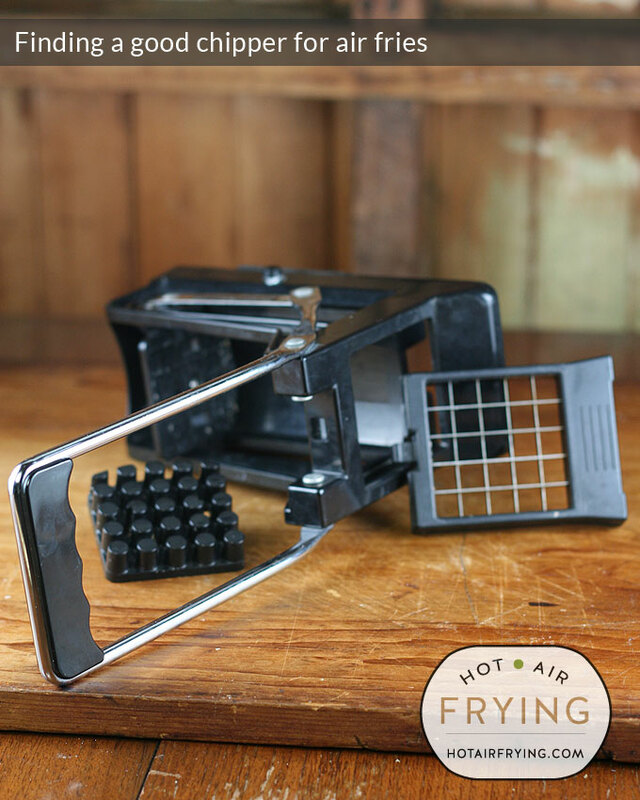 Those blades look like they would take forever and a day to make a simple batch of crinkle cut fries / chips. I have read that I could use my mandoline to make them, but I don’t understand how yet, or how much futzing it would involve. I have made waffle fries from a bag of frozen in the pan of my Actfry air fryer, with the paddle in, and they turned out fine. I’ve only tried once — so far — to make them from scratch with my mandoline, and it was a disaster. They were too thin or too thick — but then, that’s down to me needing more practice. The real problem, though, was what happened to them in the bowl of the Actifry: the paddle just squished them all into a ball of mooshy potato. So I haven’t gone back at it yet since, though I will revisit it at some point in the future. The model that I bought, under the name of StarFrit, seems to be sold actually under several different names, including Culina, Prepworks, RSVP and Kitchen Craft. 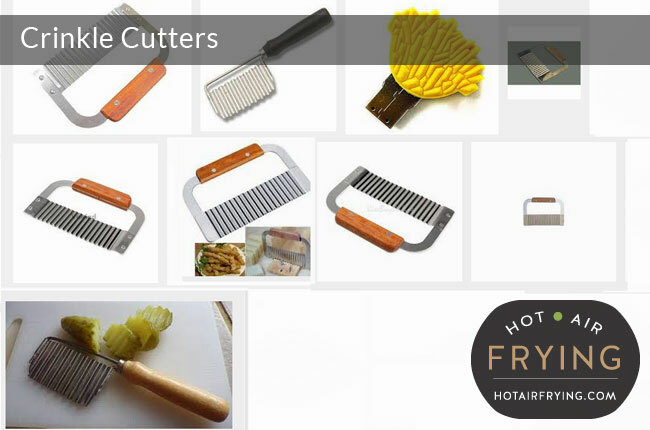 The Prepworks, RSVP and Kitchen Craft names seem to come with interchangeable blades — for thicker or thinner fries, and for around the same price, so that is definitely a step up from the actual version I got. The colours offered seem to be white, black or red; you don’t seem to get any choice, it just seems to depend what name you buy it under. They cost around $20 bucks / £12 pounds. In Canada, the two-blade version seems to cost a few bucks more. I see from the reviews that people are saying that even if the Amazon picture shows sides of the chipper being all metal, don’t count on it; they may be shipped plastic anyway. 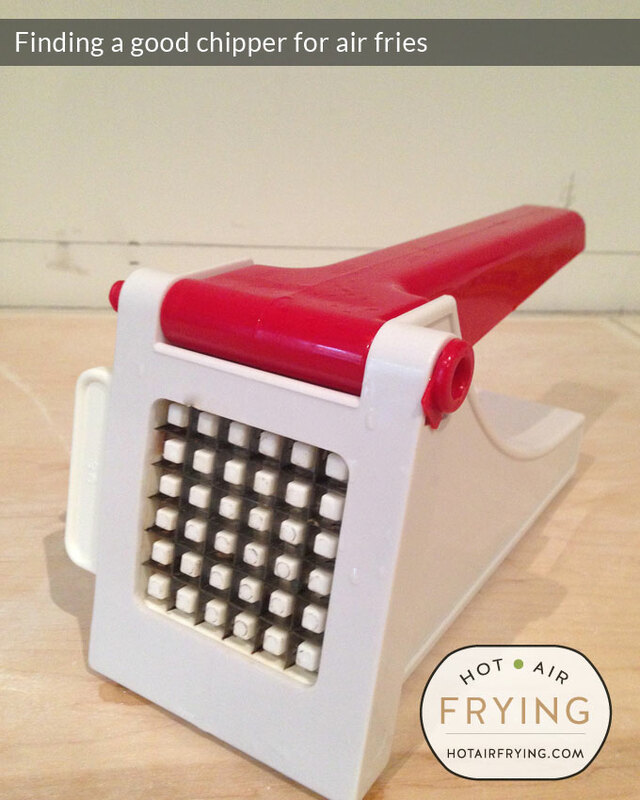 But I’m also seeing people saying they’ve had this kind of chipper for years and it’s lasted very well. 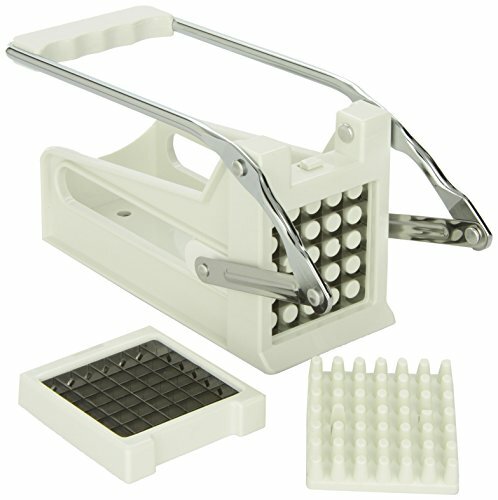 In any event, all that is just to say that there’s no need to spend a lot of money on a chipper / French fry cutter, though you can spend up to a 100 bucks on one, if you really wanted to and had the storage space for it, as those tend to be much larger machines. 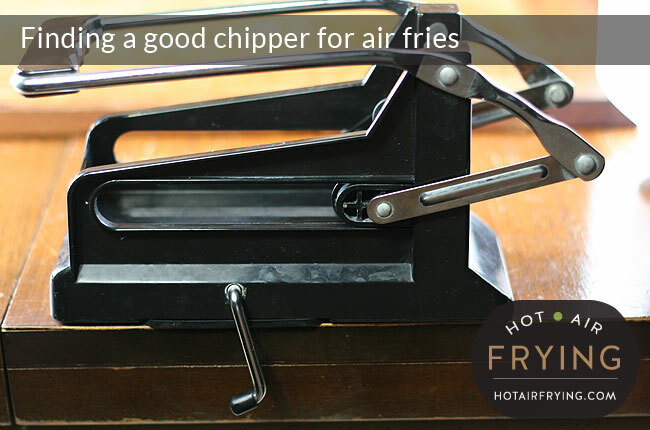 You might also wish to see my tips so far on how to use a potato chipper.